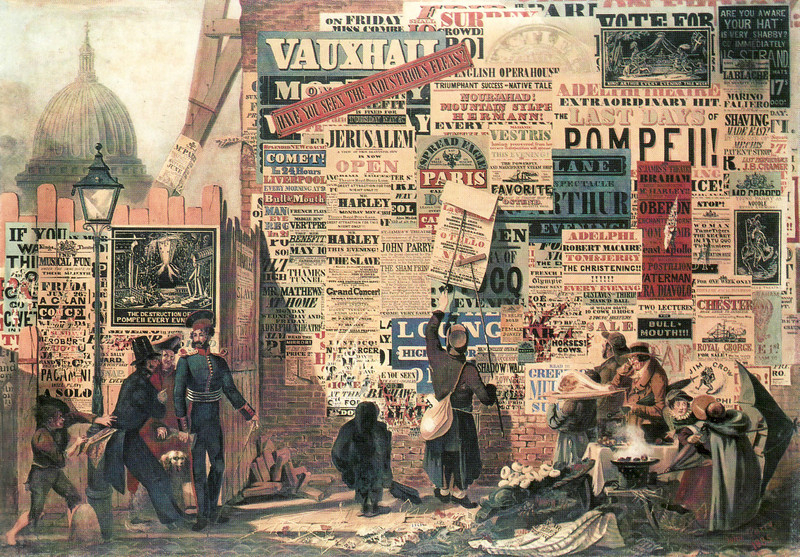 In 1855, James Dawson Burn’s book The Language of the Walls argued that reading posters could be revelatory: the mass of announcements on London’s walls displayed the roots of a new kind of language, that which underpinned the developing commodity culture of Victorian Britain. In the same way, Orlando Parry, the painter of A London Street Scene (1), showed posters as a new visual extravaganza to be admired. Here, St Paul’s Cathedral is literally shut out by this modern spectacle, the cornucopia of typefaces offering their own fascinating insight into the life of the city. Although the cliched cast of London social characters that fill the lower half of the painting ignore the bill-sticker pasting up his latest offering, Parry has clearly paid microscopic attention to the details of these curious objects – their typefaces accurately reflecting what would have been available to printers in the mid-1830s. Throughout the Victorian period, Punch featured many cartoons showing wall posters in London. Yet, unlike Parry, Punch mocked the supposed value of the spectacle they generated. In 1847, the magazine drew attention to the daily ‘Bill-stickers’ exhibitions’ that could be seen almost anywhere in the city (2). With St Paul’s again obliterated by a makeshift wall of gigantic posters, Punch shows a respectable group of visitors come to see this impromptu exhibition. Here, everything is exaggerated, dictated by competition, and leading to an illegible mass of words and images. Such a spectacle reflected the quackery and puffery of advertisers, both of which needed to be better regulated and controlled. Yet, the accretions of posters on walls might also lead to the formation of new unintentional meanings. 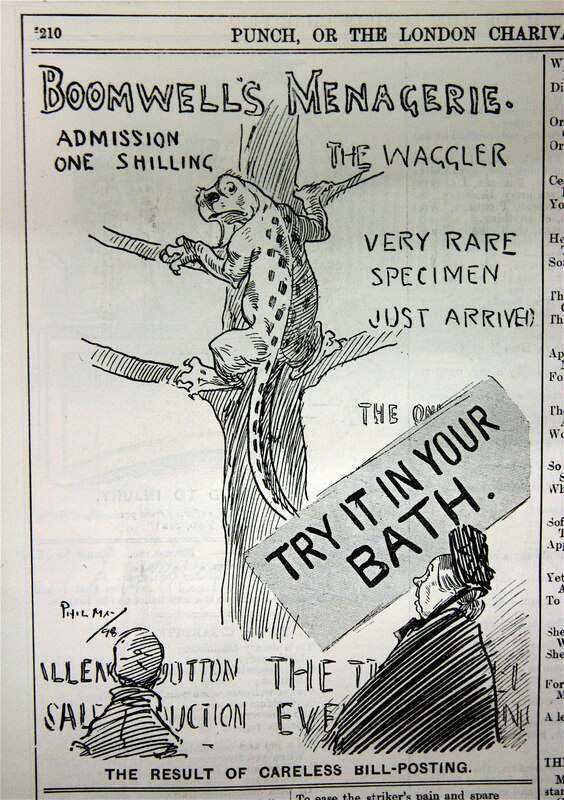 So ‘the result of careless bill-posting’ (3) in 1898 was an accidental joke – the bemused onlookers wondering if they really should try this strange specimen of exotic animal in their baths. Although Punch is probably mostly interested in the comic potential of such accidental juxtapositions, the magazine also hints at other concerns. As the cartoon graphically demonstrates, reading posters was not like reading books or newspapers – one had to be able to negotiate these random juxtapositions, to be able to read in a different way. This was a peculiarly modern form of perception, being able to decipher the new visual language of the commodity, one that was dictated by free competition. The result – a kind of visual pandemonium – might confuse or delight in equal measure; despite their commercial basis, these posters might also reveal new and unexpected meanings if we had the right perceptive tools to decipher them. 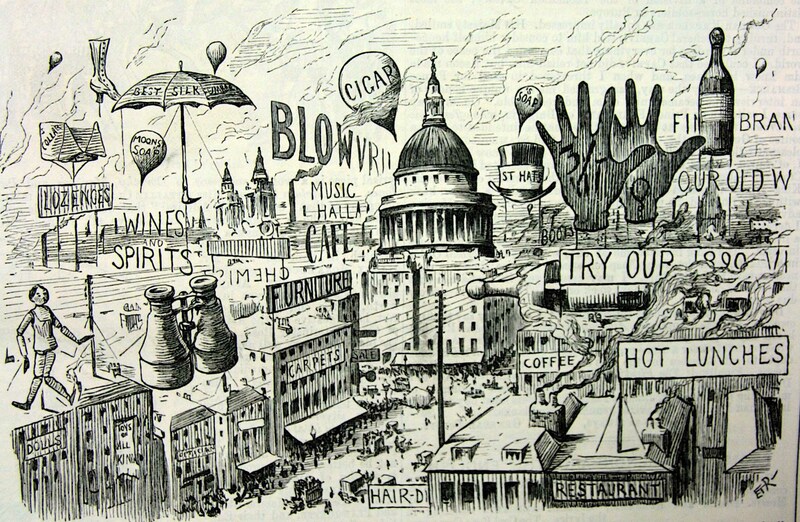 In 1890, Punch pictured what it saw as the logical development of the city poster – a skyward development of advertising where the ‘swinging signs of ogre Trade’ invaded ‘the smoke-veiled vaults of heaven’ (4). In this future London, gigantic letters would float freely or on balloons, obscuring St Paul’s or even the sun, while outsized binoculars, gloves, hats, umbrellas and bottles would soar to ‘monstrous heights’ above the city. With savage mockery, Punch uses this vision of future ‘sky-horrors’ to castigate the laissez-faire attitude towards posters and hoardings – a warning of what may result if advertisers were left unchecked. Yet, this is also a strangely prescient image – a kind of Heath-Robinson version of the skyward spectacle of Ghost in the Shell (1996) or an anticipation of the sign-as-architecture that came to define the cityscape of Las Vegas. And was it this image that inspired Frank Gehry to commission Claes Oldenburg and Coosje van Bruggen to build part of the Chiat/Day Building (1985-1991) as an enormous pair of binoculars – an iconic herald of the dissolution of modernism into a melting-pot of styles?